Disclosure: I was compensated by Aldi for this post but all opinions expressed here are my own. I buy a lot of groceries. And when I say a lot, I mean A LOT. For the last five months, I have balanced a grocery budget that has included constant cookbook recipe development and testing, blog recipes and brand assignments, not to mention meals for my husband and I. It is enough to equal our mortgage if I let it. That’s where Aldi comes in. Aldi has been a grocery store of choice in my family for years. It always comes through when you still want quality ingredients and products for less. Shopping there has helped me save tons of money without losing the high end level of products that I love to have. And this ground turkey and sausage which you can use for the meatballs, and other key ingredients for no more than 15 bucks. I even picked up some snacks and didn’t feel like I had to adhere to a safe budget. Everything is in budget when I shop there. When you switch your staple items over to Aldi, you will no doubt feel the same. Now speaking of this spaghetti and meatballs, I have been making this recipe for quite some time in my house. I usually throw some of this and some of that in, and it works. I tend to cook very organically. However, I actually tried to write down a bit of my instructions so I could share the recipe with you. I love to use turkey or chicken sausage and ground turkey or chicken to make them lighter but you can definitely make these with regular pork sausage or ground beef or whatever you prefer. The taste is still absolutely incredible. The homemade sauce is so simple and absolutely delicious! It only requires a few ingredients as well. This recipe is very easy but the flavor is amazing, and you won’t believe how cheap it all was to make! Get to Aldi, pick up the ingredients today, and get to cooking for less! You have wonderful recipes. I plan on trying some of them very soon. Your baby is Beautiful. Children are a blessing from our Creator. Enjoy her while shes young because time travels very quickly. Too quickly some times. You’ll soon be amazed at how quickly she will grow into a beautiful young woman! Awww thank you so much Linda for the super sweet and kind message. She is my greatest blessing. Hi, I’m new to your website and I ‘m so excited to try some o your recipes. I will be making your garlic bread along with your spaghetti soon. For your spaghetti , can I make a meat sauce using your ingredients and seasonings instead of making meatballs? Sure you definitely can Val! I hope you enjoy the recipes. Let me know how they turn out for you!! 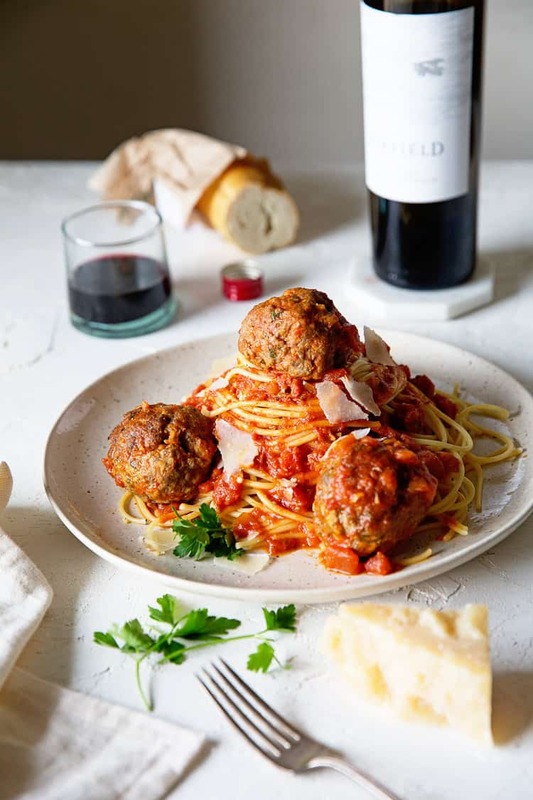 Spaghetti and meatballs is the perfect comfort food for these cool autumn nights. Love this recipe, Jocelyn! There is an Aldi opening close to me finally! I’m soooo excited. 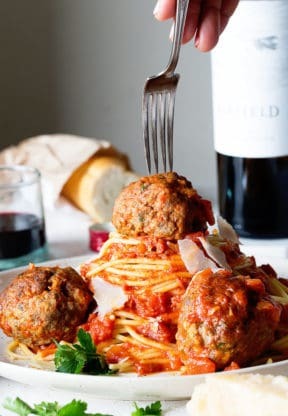 This spaghetti and meatballs looks to die for! I love Aldi after going for the first time last week! SUCH great deals! And this spagetti looks AMAZING! Hooray thanks Lindsay! There are seriously so many good deals there. 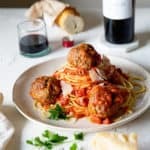 lOVE THIS BLOG & SPAGHETTI AND MEATBALLS AND ALDI (GREAT STORE)!!! Thanks so much Lisa! It is a great store! Oh gosh I wish you had one closer too! Oh my gosh the food budget is out of control! I cringe every time I check out. 🙂 Loving this recipe – meatballs are a favorite! Gosh I cringe too and then a single tear falls. Too much money!! Yes the turkey or chicken totally lightens this dish up. I don’t feel as full at all lol. Jocelyn, don’t we know it about those grocery budgets that look like former single career girls shoe budgets! How are you doing? Pity they are not out here in the Meddle East! Gosh it is hard to stick to budgets especially when you need specialty items. I’ve read a couple of these Aldi posts and the store looks awesome! We don’t have them out here, but I am always trying to shop around for a deal! Gosh I hope you get them soon girl! Nothing like a delicious meatball! Too bad we don’t have an Aldi here in RVA yet! Well I hope you get one soon so you can see experience all the savings! I’ve been reading lots of positive reviews about Aldi and that really made me want to visit one. Too bad, there’s none around here, but that will be on my to-go list. 🙂 Your spaghetti meatballs definitely looks so comforting. Nom nom! Yes Aldi has amazing prices. Where do you live? and thank you so much! I wish we had an Aldi closer! Your homemade dinner looks easy and delicious! PS Can’t wait for your cookbook!!! Hooray thanks so much Krystle! Aww I wish Aldi was closer to you too. Where do you live? Ugh, this looks sooooo good. I love Aldi! and this recipe looks delicious! spaghetti and meatballs is such a comfort food for me! It is such a comfort meal for me too. And so easy to make too! Love spaghetti and meatballs and love shopping at aldi! Great place to save a bit! Indeed! I didn’t realize how many people love Aldi as much as I do! love spaghetti and meatballs .. and hey, what’s not to love about saving money?! LOVE ALDIs!!! Yep the saving money part is incredible to me! I can’t believe how much money you save!